Male robins have two main goals in the spring: to attract a mate and to defend its territory. It is this second goal which results in them banging into your window. To be accurate, the bird is not banging into the window so much as he is attacking it. Or rather, he is attacking the bird he sees in your window – his own reflection. Male robins are highly territorial in the spring, when it is defending the area around its nest site. When it looks at your window, it sees a potential interloper in its territory, which it then attacks. The robin does not realize it is looking at a reflection; to him, he is looking at an intruder, and one that must be chased from its territory, regardless of how long it takes or how many times it has to be attacked. 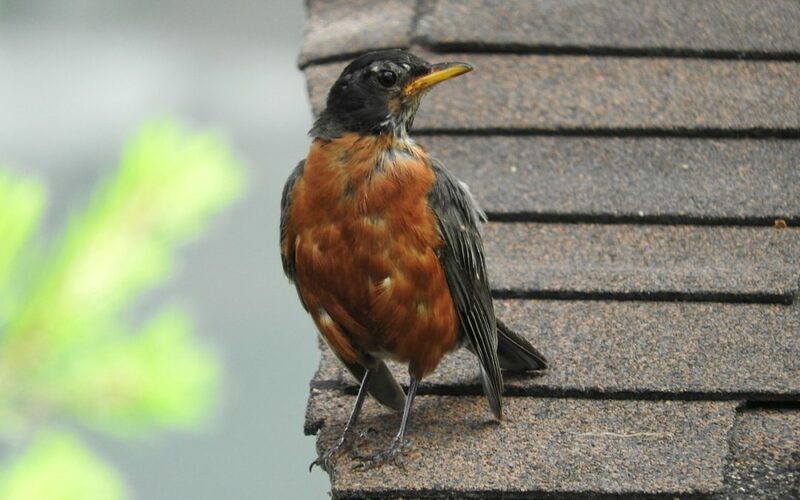 This question arises most often with robins, as they are a common nesting species in cities. However, the same behavior is apparent with just about any other songbird species which is nesting near your house. There are two ways in which this behavior will end. You can be patient and wait a few weeks until the Robin’s young have hatched and have left the nest, at which point the Robin will no longer feel the need to defend its territory. Or, if the noise from the attacking Robin is starting to get on your nerves, you can remove the “intruder” (i.e., his reflection) by placing objects along the base of the window that would block a reflection. A couple of ways to do this is to tape a piece of white paper to the window, or rub a something white along the window pane, like a bar of soap. If the Robin can no longer see his reflection, he will stop attacking the window.